Not to be confused with World 1-4, Level 1-4, or Stage 1-4. Area 1-4 is the fourth course of Coaster Hills and the fourth course overall in Mario vs. Donkey Kong: Mini-Land Mayhem!. It introduces the concept of guiding Minis to their own respective doors. The level features one Mini Mario and one Mini Toad inside of a capsule. Both Minis begin on the top right, with the Mini Mario door on the top left and the Mini Toad door on the bottom right. In order to reach it, the two Minis must be isolated via placing a Red Girder bridge down just before the Mini Toad reaches it, then having both Minis enter the Warp Pipe simultaneously. If done correctly, they will be led right to the exits. The M-Token is located at the middle level on the right. It can be collected by drawing a Red Girder bridge over to it and having the Mini Toad collect it just after it exits the Warp Pipe a second time. 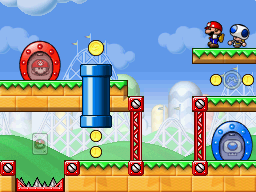 The Mini Mario Card is located on the bottom left. It can be collected by having the Mini Toad enter the Warp Pipe from the top right and have a Red Girder constructed over the Spike Trap.